However, because of the unusual circumstances, we will be waiting for official word from Tesla before updating our Plug-In Sales Scorecard. FINAL UPDATE 7/12/2018: Tesla never gave us an answer either way, however there is good news. In our follow up post we came to the conclusion that it was likely Tesla passed 200k deliveries but that due to IRS rules, they may not have passed the 200k threshold for tax credit purposes. Now Tesla has posted on their U.S. Website that the tax rebate will be available through the end of December! Needless to say as a future Model 3 owner, this has me thrilled. It looks more likely that I and others looking for the Short Range 3 will have access to at least the 50% rebate. We have updated our follow up post with more information here. UPDATED 7/8/2018: Tesla released numbers on 7/2/2018 much earlier than we anticipated. (I stay up past midnight finishing off our Tesla estimates... and I could have just waited 8 hours for the final numbers!) The official numbers show our Model 3 estimates for the quarter were spot on. Model X and S numbers also met our expectations. Q2 deliveries totaled 40,740 vehicles, of which 18,440 were Model 3, 10,930 were Model S, and 11,370 were Model X. Our initial estimates posted 7/2/2018 for the US in June and Canada (Late May + June) can be viewed below. After reviewing the numbers released that same day by Tesla, we have updated our estimates in the Plug-In Sales Scorecard. 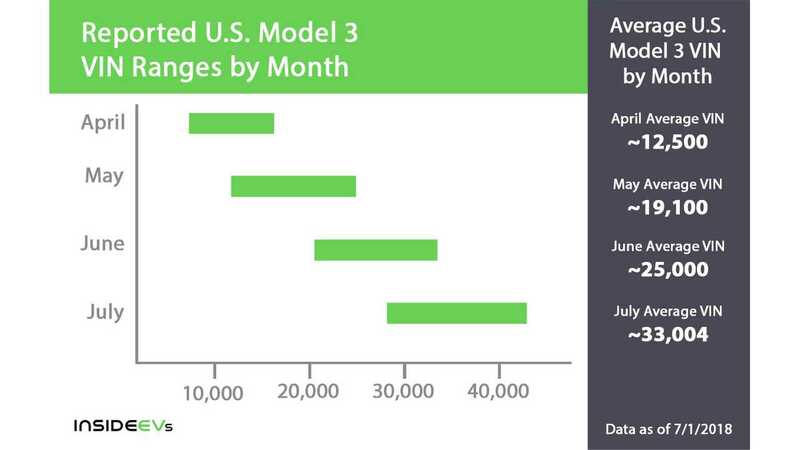 Model 3 US estimates were increased by 12 units. X + S numbers were adjusted based on official numbers and after receiving new VIN info. 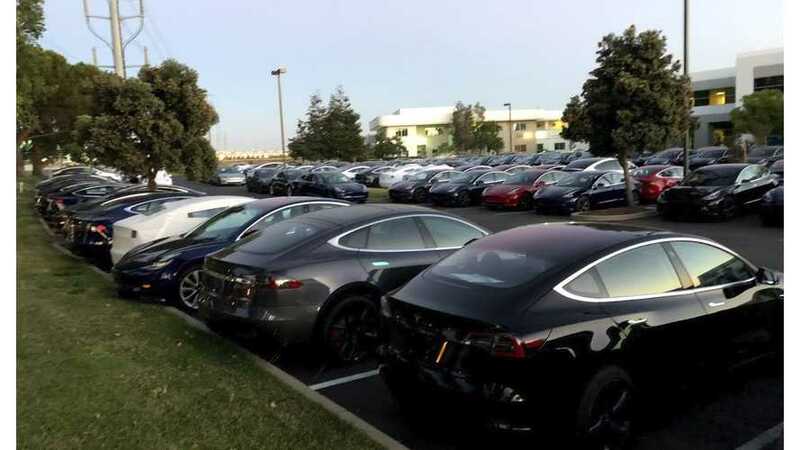 We have also provided an updated article explaining that it is possible Tesla has crossed 200,000 deliveries by our criteria, but the IRS may have specific criteria in determining when the 200,000th vehicle is sold or if a vehicle counts towards the total at all. Until Tesla or the IRS makes a statement, we cannot be sure they have triggered the 200,000 rebate. Check out this article for a bit more info about what we found. We will provide additional updates as we parse any future info released by Tesla. We also reached out to them regarding the 200,000th sale and will update this article if we receive a comment. Tesla and General Motors are both going to pass 200,000 US sales in 2018. This will have major implications for many buyers hoping to receive the full $7500 credit. If you are not familiar with the U.S. federal EV credit, check out the article here. Estimating June deliveries is far more difficult than usual for many reasons. Tesla had a 5 day production shut down in late May that would surely impact Model 3 deliveries in June. Tesla also changed their VIN assignment timeline in June. Previously, owners waiting on their vehicles would be able to view their VIN weeks ahead of delivery. But this month, many owners were not receiving their VIN numbers until 5-10 days before their scheduled delivery. The accelerated time frame between VIN assignment to delivery means less people have reported their delivery info. However, the growth in VIN numbers appears to have continued as usual. Below is a rough approximation of VIN ranges assigned between April and July. Extreme high and low VINs are not included in the above graph since they are typically outliers. June was also the first full month when deliveries were made outside of the United States. The initial push of Canadian deliveries was very strong, but by mid-June had dropped significantly. Model X and Model S sales in the U.S. appear to be up slightly over last year as well. We are expecting 2400 Model X and 2900 Model S made their way to U.S. buyers. In any normal month we'd feel 100% confident with these numbers as is. However, this is not a normal month. 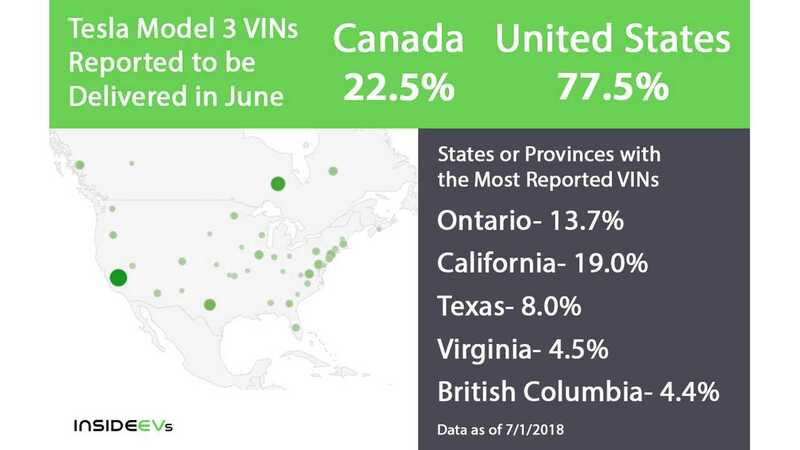 With Tesla changing how it assigns VIN numbers and Canada getting their first Model 3s this quarter, matters have already been complicated over previous quarters. More important is Tesla's 200,000th sale. Production certainly has not stopped and deliveries have not stopped either. Canadian deliveries appear to have returned to normal levels after a brief spike in late may and early June. The only way Tesla could have delayed any further would be by stocking vehicles for weeks. Would the company be willing to halt sales in order to extend the availability of the full tax credit? Perhaps. I have certainly been hoping they would do so. If Tesla chose to re-schedule or delay most of the deliveries planned for the last week of June, it might have been possible to push back the 200,000th sale to July. Unless the buyer reports the change there is no way for us to know it has occurred. So our traditional estimate methods may not apply if Tesla has taken this action. But we do not have enough evidence to make us believe this occurred. The other wildcard is historical numbers. When estimating deliveries over the course of 7 years, there is going to be a margin of error. We do not know the exact number of roadsters that would have qualified for the credit for instance. The breakdown of U.S.-bound S/X sales is estimated as well. While Nissan and General Motors (until recently) always provided exact sales numbers, Tesla rarely has. So estimating Tesla deliveries is tricky business. InsideEVs gained a reputation for providing not only the best initial Tesla estimates, but for keeping the numbers updated over time when exact numbers are provided or leaked. In the hands of Jay Cole, the site historically made U.S. sales estimates that were intentionally conservative. So the likelihood of estimates being significantly overestimated is small but worth noting. So what will the final Q2 Model 3 numbers show? We have provided our estimates. While I would personally like Tesla to delay until Q3, I'm also happy to see the company continue to grow and expand during this exciting time. Given the unusual circumstances, we are going to delay updating the sales scorecard for Tesla for a few days. Once we receive quarterly numbers from Tesla this week, we will compare them to our own and update the sales chart with our final numbers. We are hoping that they will provide guidance on whether they have passed 200,000 or not as well.